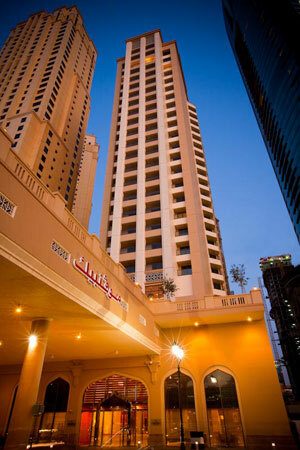 Located in the new Jumeirah Beach Residence complex, between the new Dubai Marina and the beaches of Jumeirah. Our established and successful Swiss traditions will enable you to enjoy top service around the clock and indulge your plate with our superb gastronomy. 294 well e-quipped contemporary upscale design rooms and suites with balconies offering partial and full ocean view, spacious bathroom, including Executive Club rooms, Junior Suites, 2 Royal Suites as well as 2 rooms for the physically challenged. All rooms and suites featuring the latest technology. direct dial phones, voice mail system air-conditioned/individual climate control, LCD interactive3 flat screen television, cable, satellite TV channels, safe deposit box, mini bar, e/coffee faculties and wide selection of in-room amenities. A range of dining experiences include The Talk, a cutting-edge new concept in international buffet, with live cooking stations and sushi bar, lounge with live DJ and outdoor poolside cabanas overlooking the sea. West Beach Bistro restaurant on the ground floor with its relaxed ambience is the perfect mid-point between a traditional bar and a chic champagne lounge. The falls is a contemporary lobby lounge and a great spot for meetings or surfing the web with high speed Internet connections, while enjoying tasty snacks and health beverages as well as Moevenpick ice cream. 24-hour in-room dining offers a wide selection of dishes as well as a children's menu. Our outdoor swimming pool overlooks the ocean and has direct access to Jumeriah Beach, with a wide range of watersports. The Health club has the latest technolory cardiovascular and strength resistance high tech equipment, sauna, steam and spa treatment rooms. The Walk at Jumeirah Beach residence is Dubai's only outdoor shopping experience by the beach , offering breathtaking views of the Arabian Gulf and boasting world class retail outlets. Dubai has a multitude of superb outdoor attractions, from championship quality golf courses and spas to water sports and desert adventures. Spectators can also enjoy a host of premier sporting events such as the world's richest horse race, the Dubai World Cup at Nad Al-Sheba; the Dubai Desert Classic Golf Tournament, the Dubai tennis Championships, Ruby Sevens, the Emirates Grand Prix power boating; the UAE Desert Challenge, and of course Camel Racing. Elegant ballroom, located in the mezzanine level, provides comprehensive banqueting faculties with a banquet room divisible into three; two meeting rooms, and a business centre. Mövenpick Hotel Jumeirah Beach is just minutes away from Dubai Media City and directly connected to the beachfront. It is approximately 30 minutes from Dubai International Airport and is close to major shopping and business districts.